Welcome to my sculpture gallery! In addition to the art directing, designing, animating etc. that I do for television and film, I am also a sculptor. I work mostly in Monster Clay and CX5 nowadays but I also have some experience in Zbrush and a good deal of experience modeling in Cinema 4D. I am a great communicator and collaborator and have an expert understanding of the creative process. If you like what you see and have a sculpture project in mind, contact me. I’m open to all inquiries/opportunities. Roland and the Lobstrosity. 1/6th scale, CX5/CX5s. This is a moment in time from the first pages of book 2 of Stephen King 's The Dark Tower series as described by the author. Staggering back, Roland draws to fire on the creature. Unbeknownst to him, his first two fingers have been bitten off. The revolver topples from Roland's abbreviated hand toward the rock and shell covered beach. Close up of one of Roland's mighty revolvers. 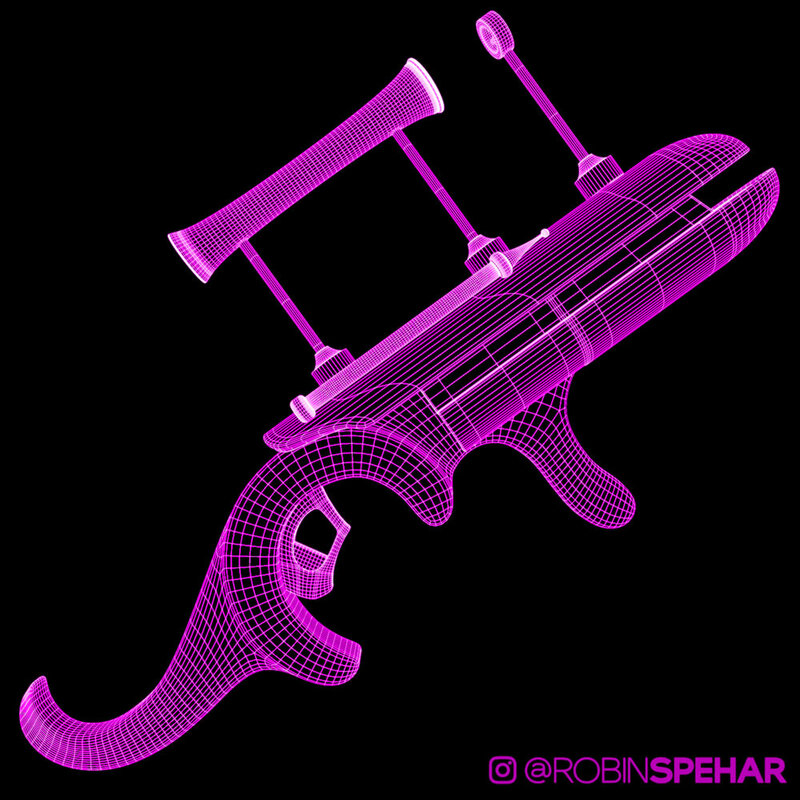 I designed these pistols based on King's many descriptions of how the guns operate and referenced several Colt models. The design of these guns are unique to this sculpture. Still got 5 on this hand! Tywin Lannister Zbrush sculpt. Charles Dance is so awesome! Large Hoop Alien. 1/3 scale Monster Clay. Still working on this one. Obviously a ton of Alien and Predator influence here. 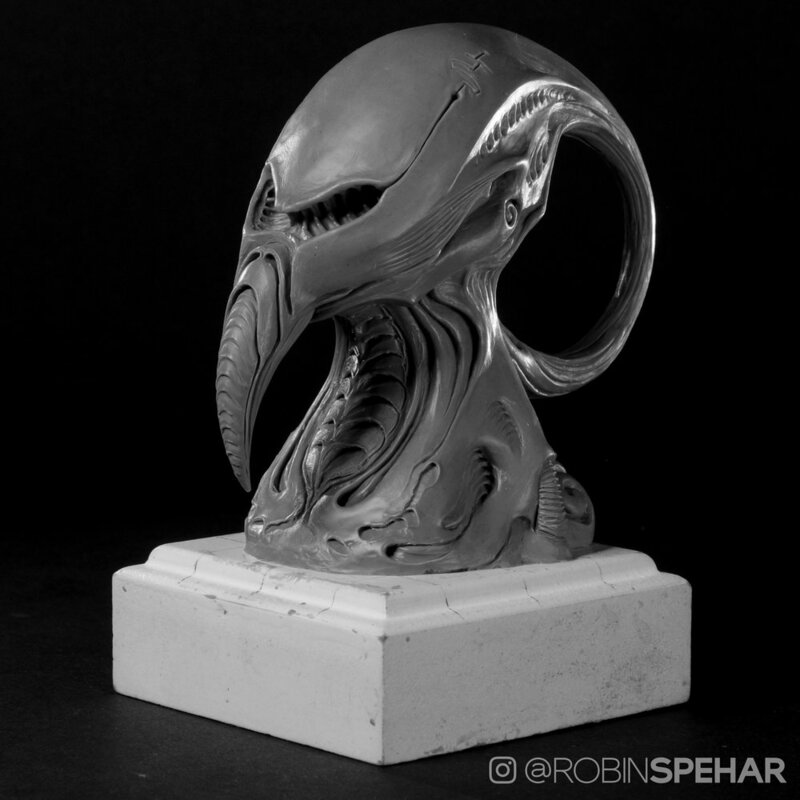 Scroll down to see my original, smaller Hoop Alien concept sculpt. This is Archimedes from Dennis E. Taylor's 3 book sci-fi series "Bobiverse". This sculpt is based on the author's description of a race of intelligent, bipedal, part bat part pig looking creatures he calls Deltans. Here's Archimedes with his son Buster. 1/6th scale, Monster Clay. This sculpt is pretty rough but gets the point across. I call this one a "Sword Demon". Sculpted in Cinema 4D. Apegga Appleonia. 1/6th scale, Super Sculpey. 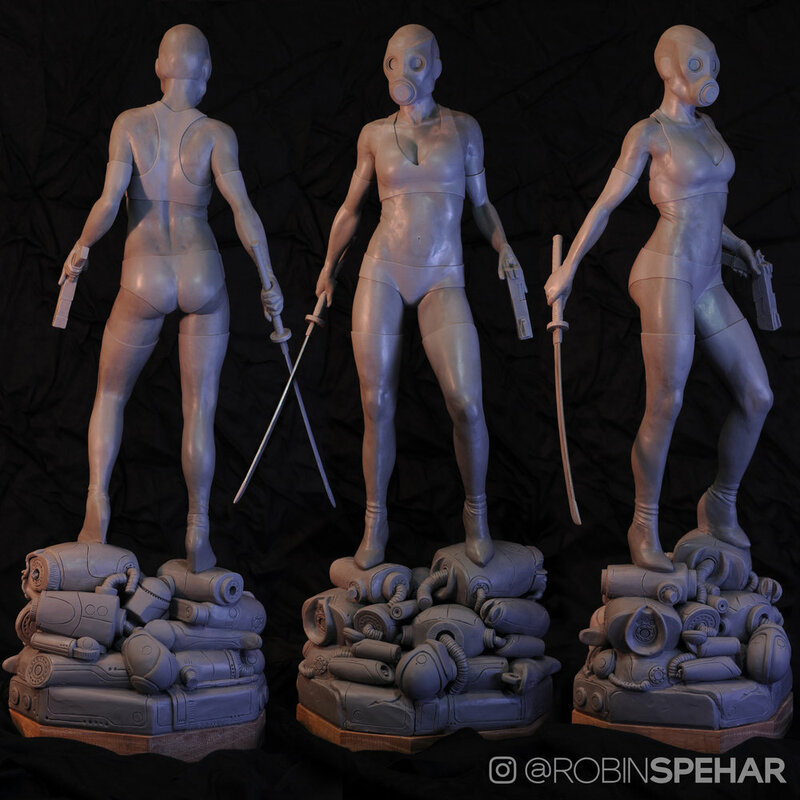 This sculpt is based on a character created by Jason Crager from his Star 13 world. Gas mask, check! Gun, check! Samurai sword, check! Aaand some dead robots. The Inkvoid Librarian. 1/6th scale CX5/CX5s. 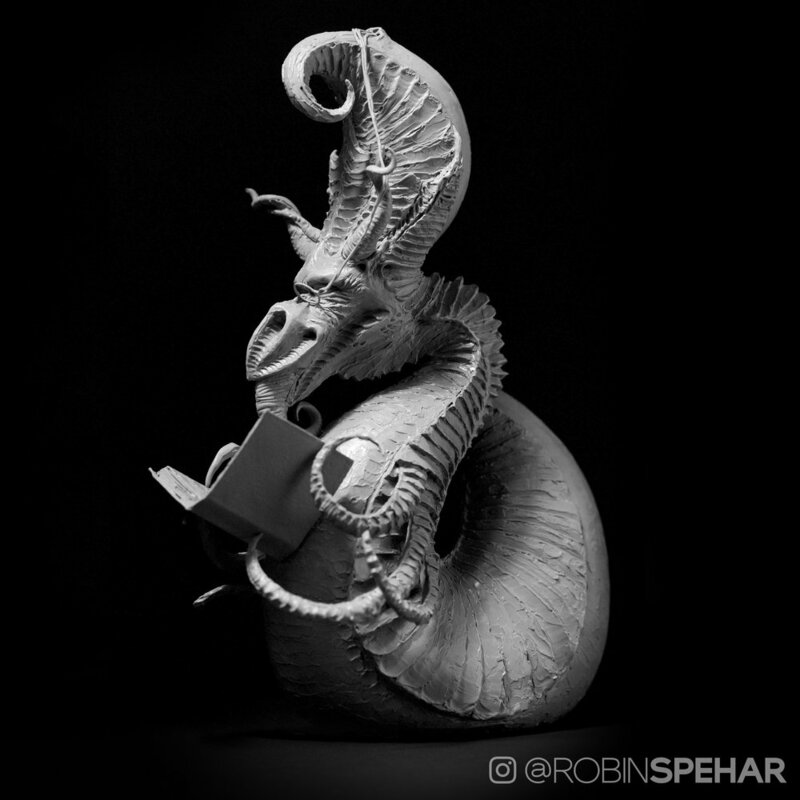 Living deep underground, this 9-foot worm spends it days and nights doing nothing but reading. Yep, it's scary as hell, but all it does is read. It reads when it's facing this way too. Hoop Alien. 3.5" tall Monster Clay. This is a quick study of line and form. This basic idea was the primordial soup from which the larger Hoop Alien emerged. Not so much "sculpting" but 3D modeling on this one. This is based on the prop gun wielded by Jane Fonda in the classic Sci-Fi film Barbarella. 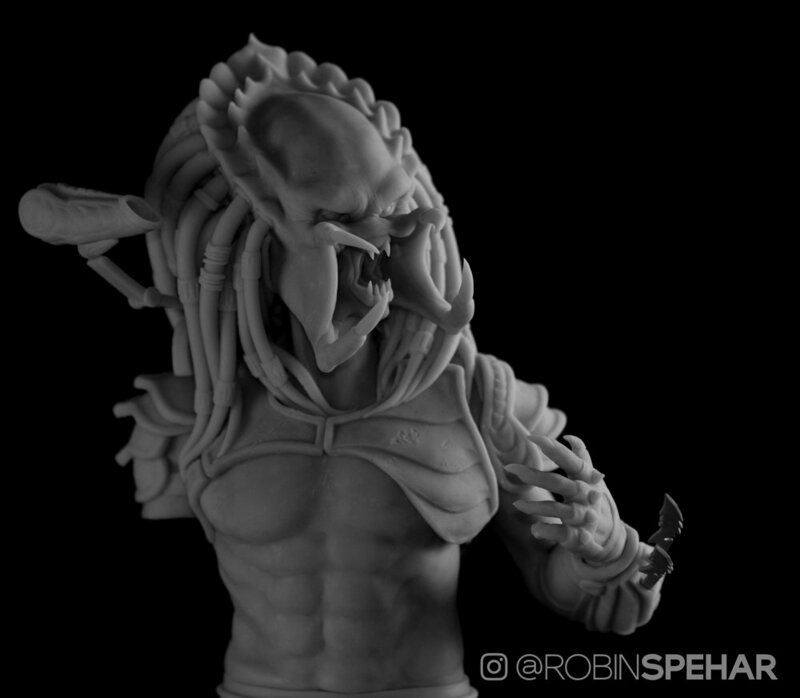 Eventually this 3D model will be incorporated into a full digitally sculpted maquette.